NEW YORK — In a game that had eight ties and 13 lead changes, it was fitting that it all came down to the final possession. Indiana (5-1) and Connecticut (6-0) had exchanged blow for blow throughout the 2K Sports Classic championship game, and the Hoosiers had the final chance to win trailing 59-58 with only 22.4 seconds left. But much like it went throughout the night for Indiana, the Hoosiers could not make the shot they desperately wanted as sophomore Yogi Ferrell missed a pull-up jump shot from the right wing, his 13th miss of the night. The Hoosiers, however, were able to retain possession following the ensuing scrum and attempted an in-bounds pass with .7 seconds remaining. It went to freshman Noah Vonleh, who only played 10 minutes due to foul trouble, and the buzzer sounded before he could attempt a shot after turning around to face the basket. 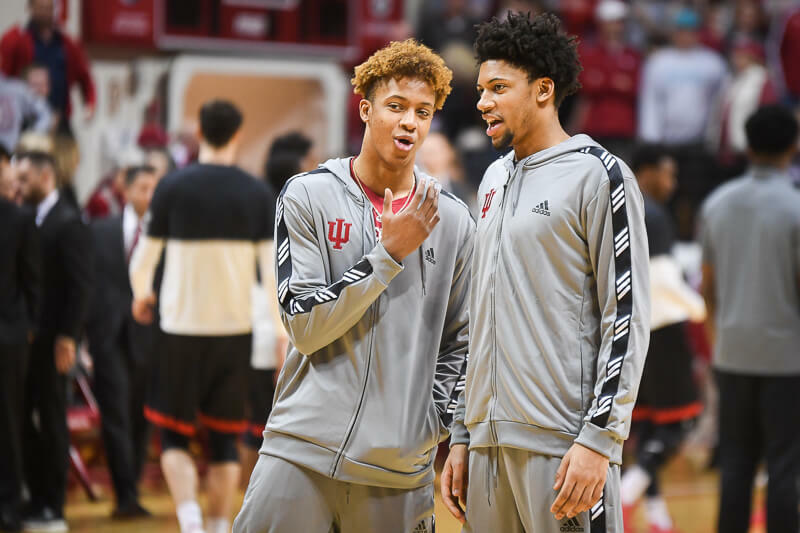 Indiana had lost its first game of the 2013-2014 season in front of an announced 10,051 at Madison Square Garden on Friday night, but the Hoosiers’ postgame verbatim was solely optimistic. “We’ll learn how to win low-scoring, close games like this,” Indiana coach Tom Crean said. “I think it says a lot about where our guys are at already for UConn to play really as slow as they did and take as much time off the shot clock as they did. 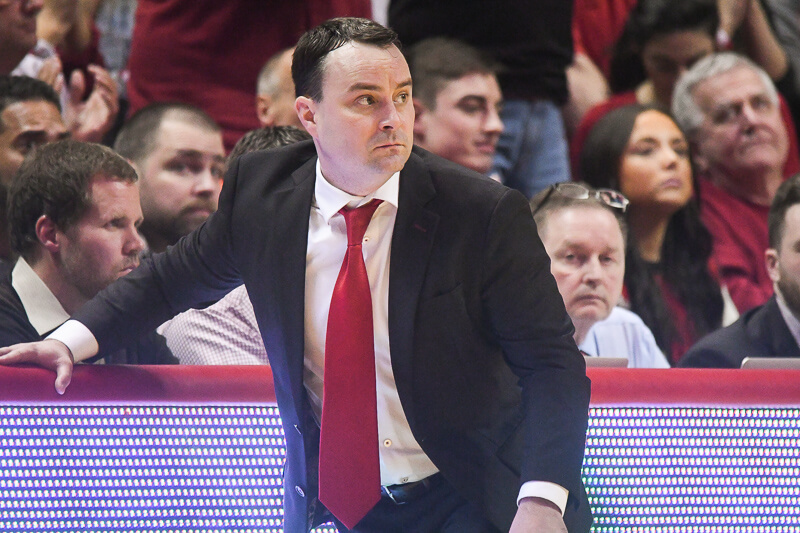 On Thursday night against Washington, Indiana was able to dominate offensively, significantly outshooting, outrebounding and just outperform the Huskies. Connecticut, however, provided much more of a challenge that Indiana was unable to overcome. The Hoosiers turned the ball over on 19 occasions, shot only 40.8 percent from the field and scored just six second chance points. In its rout of Washington, the freshman duo of Vonleh and Troy Williams combined for 40 points and 17 rebounds. Against UConn, the pair combined for two points and eight rebounds in 35 combined minutes. Vonleh was in foul trouble from the start — he finished with four — and UConn forced the Hoosiers into a half-court offense that stifled their offensive productivity. Much of the late-game play on Friday came from a flurry of shots from both teams that sent the Madison Square Garden crowd into a frenzy. In the final 6:15 alone, the lead changed hands six times, from a Ferrell free throw to ultimately, a Shabazz Napier layup — the final two of his game-high 27 points with 1:35 remaining. The Hoosiers had the final chance to win after Napier was called for an offensive foul with 22.4 seconds left, his seventh turnover in 38 minutes of action, but the Hoosiers were unable to convert on the subsequent possession. Despite the loss, Ferrell remained positive, saying that he and his teammates will take the experience and learn from it. His performance wasn’t everything he wanted — he missed four free throws and turned the ball over seven times — but after UConn’s one-point win over Indiana, it was clear that Napier was a deciding factor. On eight separate occasions Friday night, the 6-foot-1 senior guard either tied the game or gave UConn the lead over Indiana, finishing overall with 27 points, five rebounds and three assists. “Shabazz Napier is just too good,” Crean said. “I imagine it would be like in the NFL trying to deal with a great running back like Barry Sanders or Adrian Peterson, where a guy can change direction at the drop of a hat. Two of those lead changes that Napier directly took part in came in the final 2:32, with UConn trailing Indiana by one point. Napier made a jump shot with 2:32 left, and after Indiana answered with an Evan Gordon floater, Napier once again answered with a layup with 1:35 left for the game’s final points. 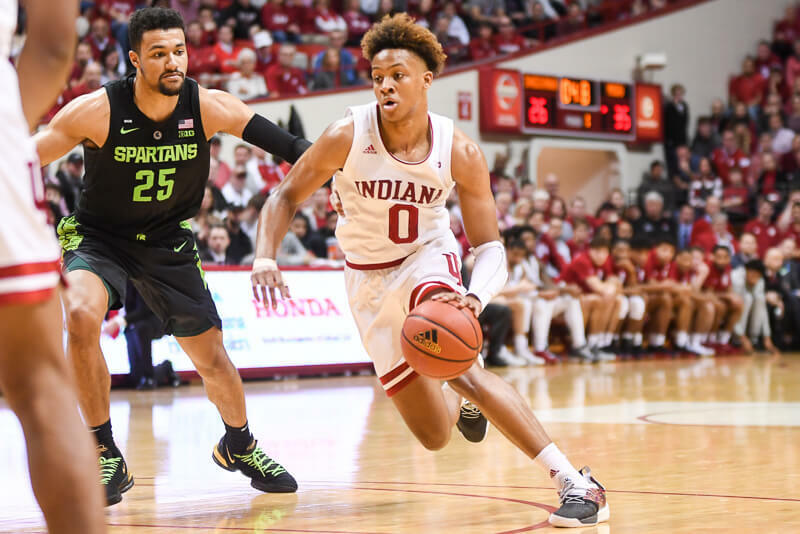 · Ferrell leads Indiana in scoring: Though his streak of three straight games with 20 or more points came to an end on Friday night, Ferrell against paced the Hoosiers with 19. He did, however, shoot just 6-of-19 from the field and 2-of-6 from beyond the arc, as he epitomized Indiana’s shooting struggles on the night. Overall, the Hoosiers shot 20-of-49 and 3-of-12 on 3-pointers. · Ferrell and Sheehey named to all-tournament team: Following the completion of Indiana-UConn, the 2K Sports Classic announced that Ferrell and senior Will Sheehey were named to the event’s all-tournament team. Joining them were C.J. Wilcox (Washington), Ryan Anderson (Boston College) and Napier, who was named the 2K Sports Classic’s Most Valuable Player. · Up next: On Tuesday at 8 p.m., Indiana returns to Assembly Hall for a meeting with 4-0 Evansville. The Purple Aces are led by sophomore guard and Kokomo product D.J. Balentine, who is averaging 29.8 points per game. Maybe “moral victory” isn’t the descriptive phrase we need here. I think “learning experience” is more accurate. Although you never want a loss, the guys will definitely take something with them from this game. And I hope Coach does as well. Learning situation for all involved. Will is also an option. I did not like him on the bench at the end–bad coaching decision. And I do not like Yogi being the focus of our offense. I would prefer that Will got more looks. Yogi is trying too hard. The recruiting notes on he and Hartmann are that they are both shooters. Unless they’re not showing it in practice, I don’t know what’s going on. Will should definitely get more looks, especially in crunch time. He should’ve been on the floor at the end too. It still doesn’t address the 3-pt. shooting issue though, because Will looks terrible from deep this year. He looks like he’s forcing it from three instead of looking for those sweet midrange jumpers he normally knocks down. Yogi shoots too much and needs to learn shot selection. He’s clearly a better shooter than last year. But he still forces shots. Sheehey needs to get more looks – he’s much more efficient with the ball. JH is not a superstar nor will he ever be. Yes he has tremendous skill and talent filled with loads of potential but he does not have the killer instinct nor the common “basketball sense” to be a true superstar. I really like Devin Davis’ game. He makes good things happen when he is on the floor. However, he’s played 80 minutes (13.3/game) and has 18 fouls. That’s nearly a foul every 4 minutes. He can’t play starter’s minutes unless he can cut back on those fouls. I think he certainly can, and will, learn to cut back on fouls but for now, it’s going to hold his minutes down some. For a second there, I would have sworn the refs thought Tom Pritchard was back on the floor against the Huskies. I agree with you, it certainly seems like we get more than our fair share of illegal screens. Wisconsin has looked really, really good thus far. They’ve had a tremendous start and at this point, I’m convinced Bo Ryan is a warlock of some kind. “I also really don’t get why Austin Etherington or Colin Hartman don’t get more minutes I get it that they cant do much other than shoot threes”…I’m not saying AE and Collin are terrible shooters, they might even be really good shooters. But what exactly have they done on the floor that tells you they are good shooters? Last year you were the big defender of JH. Not hearing much now ! What happened ? You were one of his big supporters last year ? I don’t remember being a big defender of JH. He does have the skills to be an excellent player.